Yummm. Although, to be honest, even though it’s salad season right now, I never want salads! I’m 12 weeks pregnant, and salads have just sounded totally blegh to me lately. I’m hoping that’s going to pass soon. I LOVE adding avocado to my salads! I know I’ll never be able to buy local avocados, living in Ohio, but they are so. delicious. Also hard-boiled eggs, which I need to start keeping more on hand, since they’re also great snacks. I definitely enjoy the occasional avocado myself. SO YUMMY. And I love adding hard-boiled eggs, too, especially if salad is the main course. But I USUALLY make it as a side, so there’s usually another source of protein in the meal somewhere. Rachel, I was the same as you earlier in my pregnancy. The salad aversion went away around mid-point, thankfully. Just in time for summer and farmers markets. Arugula with grape tomatoes and avocado is always a winner at our house. Greens with fresh dill and cucumber and olives is great too. Greens, grapes, and feta is excellent. Romaine, tomato, onion, cucumber, and peppers get chowed down too. Salad is almost always the most popular item at our supper table. I find the more I make it, the more people eat of it. Salad is very very popular at our table. I owe it to the homemade dressings and fresh fresh local veg. We get a CSA share of fresh veg every week and I get the best use out of and the most salads made from our greens and lettuces when I wash and dry and store them ready to go into a salad in the refrigerator. My favorite dressing is about 2 parts extra virgin olive oi, 1 strong part tasty vinegar (sherry, cider, red wine, white wine, or rice), bloop of dijon-style mustard-country or smooth, crushed garlic, tiny drizzle of maple syrup, honey or pinch of sugar, heart pinch of dried or good amount of fresh chopped herbs, salt & pepper, warmed to room temperature and whisked before using. YES. Salad becomes much more popular when the dressing is homemade, in my experience! All of these sound amazing. I think I’m going to make salad all week now. Also, I toss our salads with the dressing instead of pouring it on top of each serving. Better coverage with less total dressing=more salad enjoyed and devoured. It usually has tuna (either high quality from a can or grilled fresh tuna), but we most often use a grilled, sliced chicken breast and rarely grilled salmon or tuna. I make a herby vinaigrette style dressing and dress the potatoes while still warm, so they absorb some of it. I also use it to ‘marinade’ the chicken etc. for grilling. I dress the greens and green beans, if using fresh, and then lay it all out on the bed of romaine and drizzle the rest of the dressing over. It’s a bit of prep work, but goes quickly if you’re used to slicing and dicing and it’s DELICIOUS! Just the essence of Summer. It’s pretty enough for guests and still easy for after work or on date-night weekend. Oh my gosh. Must make. It may be a little bit of work, but it looks like it could be a meal in itself, so I’d be willing to put in the effort! my Green Salad: romaine, spinach, broccoli, scallion, peas, avocado, pumpkin seeds, and a dressing made of lemon juice, miso, tahini, and nutritional yeast. my Nikki Salad (because I stole the idea from my friend Nikki): romaine, baby mixed greens, kraut (a mix of cabbage, carrot, and beets – SO GOOD! ), cherry tomato, avocado, walnuts, and a dressing made of lemon juice, tahini, and nutritional yeast. my Favorite Kale Salad (because it’s my favorite): kale, cherry tomato, avocado, scallion, sunflower seeds, and a dressing made of lemon juice, miso, harissa, tahini, and nutritional yeast. YUM! Thanks for sharing, Rebecca. I make one Asian noodle salad (the word “salad” is used very liberally) that uses tahini, and I LOVE the dressing. 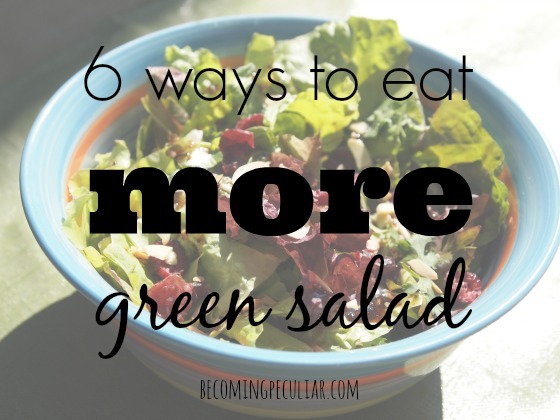 I never thought to try it before, I now i think I really need to try it on green salads, too! I love chopped salads to death. 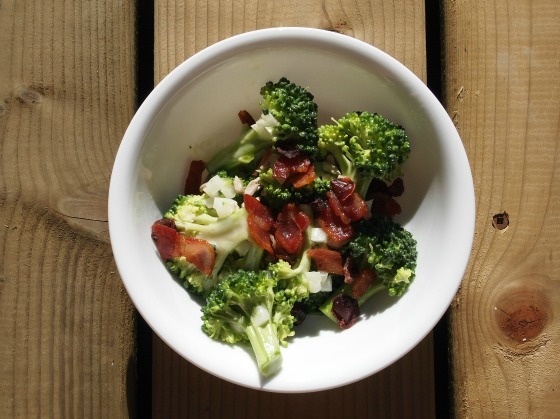 Whatever you have on hand, chopped up in a bowl, dressed with whatever else you have on hand. 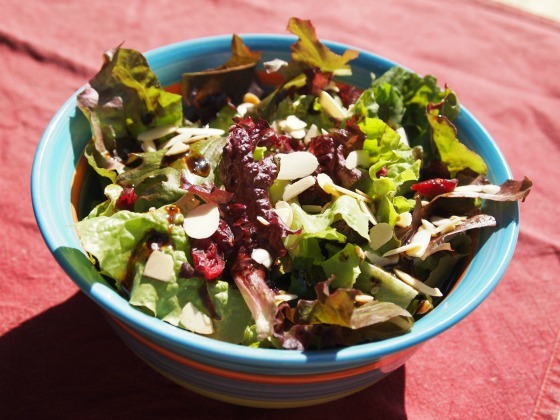 One of my favorite salad recipes is for a strawberry chicken spinach salad. Spinach, sliced strawberries (dried would work too), candied pecans/walnuts (very easy to do stovetop and keep forever), and sliced chicken (I like to use a lemon pepper seasoning on mine, breasts or thighs, or even a whole chicken pulled apart). If it’s in season, red pears are divine on this as well. The dressing is very simple and comes together in a flash with a cherry vinegar I made with cherry pits last year, olive and/or sunflower oil, dry mustard, salt, sugar, and poppyseeds. The base recipe is on Penzey’s website if you’re interested; but I’ve tweaked mine along the way. One of our family favorite meals is to cook up a bunch of quinoa in bone broth. Roast broccoli and cauliflower in the oven. Toast up some garbanzo beans. Make a thick dressing with tahini, sunflower seed butter, lemon juice, garlic, a touch of olive oil, and water to desired consistency. Stir everything together. Die and go to heaven. So good! I highly highly recommend the recipe book Fresh (by Kimberly Harris? I think?). It’s a whole book full of recipes for salads and it is delicious. It taught me how to make salad dressings and gave me lots of great salad ideas. I would also add that we would never eat salads unless we made it a main meal. Too much work for just a side dish. I even converted my husband, who is a carnivore, into loving salads, so I am now convinced that anyone can enjoy salad as a main meal (just add in some meat or cheese or beans or nuts to make it a little more filling). Okay, I know this post was from a while ago, but I thought of another way to eat salads more often. We will sometimes substitute lettuce for rice. And we’ll use whatever meat/gravy we have made as toppings for a salad. Yum! You can eat anything with lettuce! My friend used to put soup on her salads as a salad dressing.